I know its not much of a saving but other Happyland items are upto 50% off. An adorable wedding scene with Prince William and Kate. 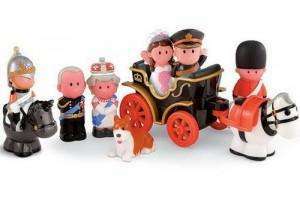 Children will have hours of fun playing wedding scenes and celebrations with this adorable HappyLand Royal Wedding set. Prince William and Kate sit in a gold trimmed horse-drawn carriage while The Queen, Prince Phillip and their favourite Corgi are protected by a Royal Cavalry soldier in full uniform and a foot soldier wearing a smart red jacket and bearskin helmet. wonder will they have them on the tables? royal family or no royal family i don't see how their wedding is any more important than any other wedding, the amount in taxpayers money that's being spent on security is a joke, and then they're trying to make money back in the form of toys..